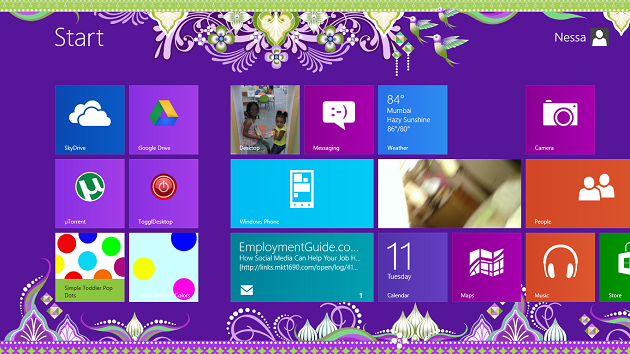 The new “Desktop”- Windows 8 has introduced a tiled, “Metro” start screen in lieu of the traditional desktop. Tiles are are able to be completely customized by the user. They are also “live”, which means apps like Facebook, Twitter, or even Weather display live, up-to-the-minute notifications. The ability to revert back to the old desktop- As much as I love the new multi-tiled face of Windows, there are times when I long(or have a practical need) for the plain, old, boring desktop. Familiarity, I guess. It’s also that some programs are better used on the Desktop. Luckily, you can switch between the old and new desktop with the click of a mouse(or the swipe of a finger, if using a touch-based device). You can even use the two desktops simultaneously(more on that later). Windows to Go- You can turn anyone’s computer into “your” computer, provided that they have Windows 8 installed on theirs. You have the option of saving your customized OS onto a USB flash drive. Simply plug the USB drive into another computer and, voila! That computer will now load your personalized desktop, start screen, and settings. This can also be accomplished by simply creating a Windows ID and adjusting your desired sync settings. Windows 8 Gestures- I should preface this with the statement that gestures work best with touchscreen devices. By swiping your finger from bottom or top edge of the screen, you can bring up app-specific commands. Pressing and holding anywhere on an app’s screen will bring up more information, or sometimes a menu. Want to close an app? Simply drag it downward until it closes. Pinch and stretch your fingers to zoom in and out in an app, respectively. Swiping left to right transitions between open apps. There are many more gestures that you may use in Windows 8. Each gesture has a mouse-click alternative for non touch-screen users! Picture Password- Use a personalized picture as your password! For touch-screen users, you now longer have to use a traditional typed password to unlock/ logon your computer. You can choose a picture and use specific gestures across that picture to unlock your screen. The “Snap” feature- Use two apps at once by snapping them into place side-by-side. With this feature you can simultaneously use the traditional desktop programs side by side with new apps from the Metro start screen. This will definitely come in handy! Windows 8 Store- Anyone who has a smartphone will understand this feature. 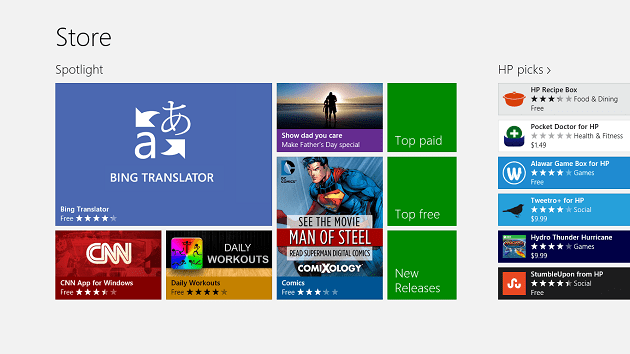 Browse the Windows 8 store to find needed apps, games, and discover new apps as well. Apps are sorted into categories and may be free or paid. Shortcuts- Here are a few easy shortcuts that may be used in Windows 8. Windows Button +D will take you to the traditional desktop. Windows Button + PrtScrn will save a screenshot to the screenshots folder in the Pictures library. Pressing Windows button + X will bring up a version of a start menu in the Metro Desktop. This menu will bring up options like Control Panel, Command Prompt, Programs, and Task Manager. You can also access this start menu by clicking in the bottom left corner of the Metro Start Screen. The features mentioned above just begin to scratch the surface of Windows 8’s possibilities. I am learning new things about this OS every day. 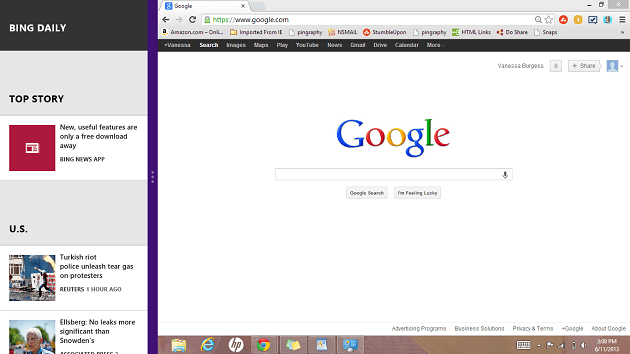 I am definitely a Windows 8 fan. What has surprised me most about this operating system is it’s ease of use compared to earlier versions of Windows. If you are still holding on to Windows XP, or Windows 7, you should give Windows 8 a try! What OS are you currently using? If you have Windows 8, how do you like it? Make lasting summer memories and “shake up” your eating experience! With this new feature on Urbanspoon, you can filter by neighborhood, cuisine and price for the greatest restaurant recommendations. Discover restaurants nearby or in a new city, save them to your wish list or mark it as a favorite and share the love. While you’re considering trying some new foods, don’t forget the traditional American summer BBQ before the season ends. Grilling & Chilling on Windows 8 will provide step-by-step instructions on how to cook the perfect barbeque so you can relax and show off your hidden grill master talent!